Out of the labyrinthine depths of the Microgaming mazes comes a new release that will get your fur in a tizzy. 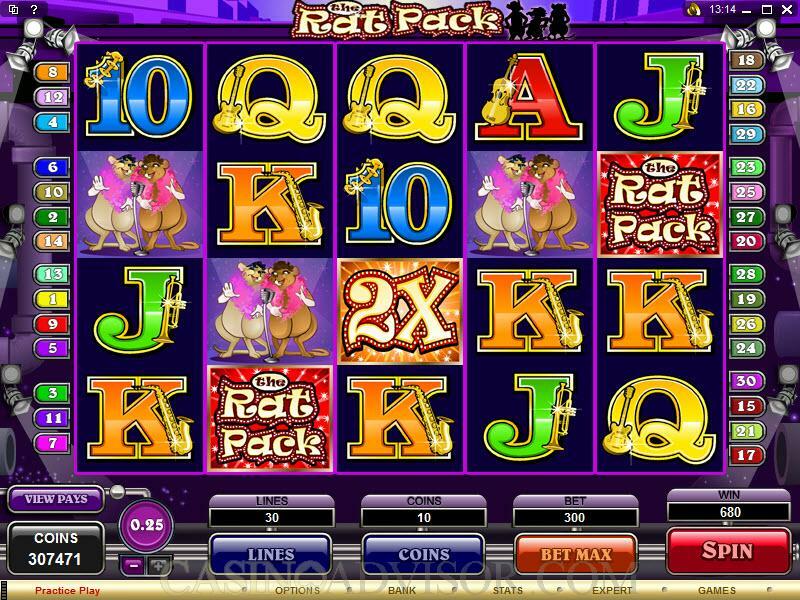 It’s called The Rat Pack, and it is a wacky new take on the now familiar video slots game that offers 5 reels and 30 paylines of hair raising action. All throughout the game, a host of entertaining and dare we say charming rats go about their playful ways, singing, dancing, and pounding on a piano. Each of the game’s reels contain the familiar A, K, Q, J, and 10 casino symbols, each of them accompanied by a musical instrument. 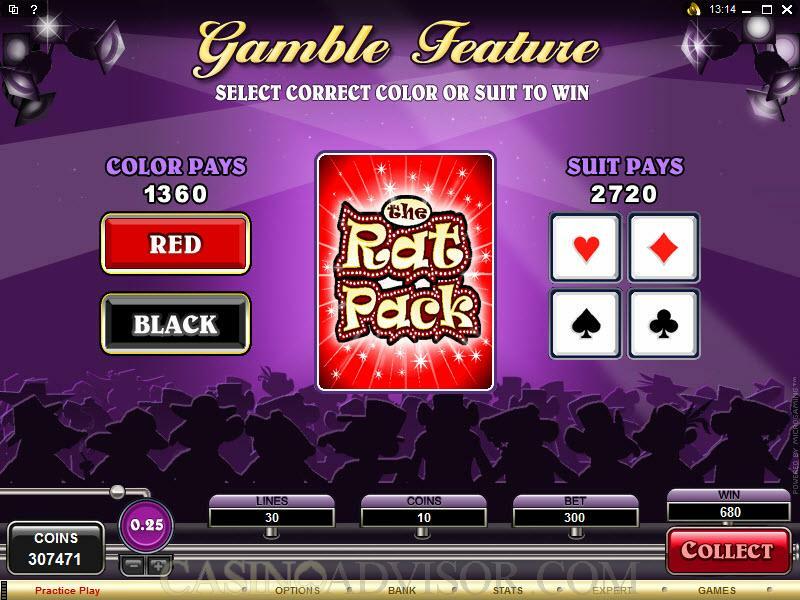 Rat Pack is a musical themed video slots game that allows you numerous opportunities to win with an astounding 30 paylines. Jazz is the name of the game in this charmingly unique slots game, and the sounds of that well-loved form keeps you company all throughout. Interestingly enough, Rat Pack comes with not one but TWO wild symbols. The first one is designated with a 2X marking, and when this is used as a substitutes symbol in order to form a winning combination, you can actually get to double your winnings on that particular payline. This symbol can take the place of any other symbol in the game, except for the gold record, which functions as the scatter. The other wild symbol in the game is distinguished by a red square marked with "The Rat Pack." When used as substitute in a winning combination, this wild symbol can get you anywhere from 75 to 5,000 coins. This wild symbol can take the place of all the other symbols in the game except for the aforementioned 2X wild and the gold record. 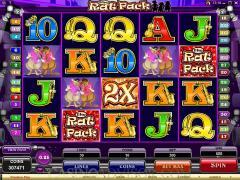 The appearance of at least 3 gold record scatter symbols on the screen will trigger Rat Pack’s free spins feature. In this section of the game, the gold record symbol remains in place for the duration of a spin, with all the other reels spinning in a normal manner. After the spin is completed, the reels that have the gold record on them are moved one position downwards, and if the gold record is still on it, the reels stay in place again. The free spins feature only ends when there aren’t anymore gold record symbols to be seen. 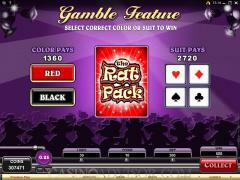 Rat Pack also offers a superb Gamble feature that gives players a chance to double or quadruple their winnings. The gamble feature is available after hitting a winning combination, if you opt not to collect your winnings. You will then be presented with the choice of a card color or a card suit. Getting the color right will effectively double your winnings, and getting the suit right will quadruple it. Interested in reading more detailed information about The Rat Pack? If so Click Here for more details.